Portwrinkle was once a small but flourishing village with its early 17th century pilchard cellars and small harbour situated halfway between Plymouth and Looe. The ancient walls of the fishing cellars still remain. Alive with colour and visitors in the summer, Portwrinkle becomes its own self in the winter, a place of the sound of the sea and wind and of its own inner stillness. 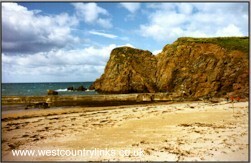 Two sand and shingle beaches, with rock pools. Car park, toilets and refreshments nearby. Easy access. Bathing unsafe on outgoing tides due to strong currents.